#50 (A-8350), #51 (A-8352), #52 (A-8352), #53 (A-8353), #54 (A-8354), #55 (A-8355), #56 (A-8356), #57 (A-8357), #58 (A-8358), #59 (A-8359), #60 (A-8360), #61 (A-8361), #62 (A-8362), #63 (A-8363), #64 (A-8364), #65 (A-8365), #66 (A-8366), #67 (A-8367), #68 (A-8368), #69 (A-8369), #70 (A-8370), #71 (A-8371), #72 (A-8372), #73 (A-8373), #74 (A-8374), #75 (A-8375), #76 (A-8376), #77 (A-8377), #78 (A-8378), #79 (A-8379), #80 (A-8380). 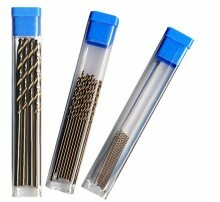 For use in small pin vise and other hand tools that hold wire gauges or in rotary handpiece with micro chucks. Click the button below to add the Foredom Cobalt Steel Twist Drills, #50 to #80, (10 drill bits per pac) to your wish list.